"...we need someone with an actual plan for the future"
Married, spouse Laura. Three daughters, ages, six, eight, and 19. What should voters know about me? I chose West St. Paul to raise my family, having known the city my whole life. When I was a kid we came to the city regularly. After living in West St. Paul a few years my wife and I noticed the city had lost its competitive edge. We decided nothing gets better unless you're willing to step up and get involved, and that's when I decided to get involved in the city council. I want our city to be a place where the next generations think of it as a place to raise their own families. Question 1. What is the most pressing consequence of the economic downturn on your community and how would you address that while in office? Ed Iago Vacant housing with shrinking home values, budget and tax considerations all would be addressed quickly and thoroughly by using every federal and local means available to us in a clearly thought-out plan using council, staff and citizen input. John Zanmiller (i) The foreclosure situation and the softened real estate market have left us with a number of vacant homes. To address this problem we instituted a rental licensing to stem the expansion of rental housing, stepped up inspections on vacant homes, and I am developing a program to lure young families to purchase homes in the city. Question 2. What is your position on light-rail development along Robert Street or Highway 52? Ed Iago Light rail will not come up South Robert Street, and if it is proposed for Highway 52 and meets the needs and benefits West St. Paul citizens, then I would support it. John Zanmiller (i) I supported the RSTS and participated in its process. I believed that transit in our area was lacking, which was confirmed with the study's outcome. Sadly the numbers would not support a light rail line, making it ineligible for federal funding. But I am encouraged by the findings over existing transit, which will help us get the Met Council to meet our transportation needs. Question 3. How should the city prioritize parks and recreation versus other spending priorities? Ed Iago Park and Rec needs are important, but spending must come after the mandatory needs of citizens have been met. John Zanmiller (i) The city's spending priorities are three fold, public safety infrastructure, and quality of life. To rank them would compromise them. If spending is made in one area at the expense of another, it could result in adverse impacts in other areas. we could have 100 police officers, but if the roads, sewers, housing stock, and parks are abysmal, where is the added value? Question 4. What can city officials do to address the effects of rising energy costs? Ed Iago We need to think outside the box and formulate, copy, plagiarize and implement every good idea we can find. 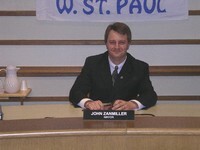 John Zanmiller (i) I supported the creation of an Environmental Committee that will help our city live and work greener and cheaper. A few years ago I initiated a study on the possibility of adding wind generation in the city. Though current technology would not support this endeavor, there is optimism with future technology, including incorporating zero carbon footprint municipal buildings, the use of geothermal heat in our new maintenance facility, and changes in street lighting. Question 5. What are your views on the city's enforcement of housing codes? How can the city improve? Ed Iago We have good housing codes and need sufficient staff to strongly enforce those codes to insure our housing stock stays stable and we as a Ccity do not permit vacant or blighted homes to have a negative effect on home values. John Zanmiller (i) The city needs to remain fair, friendly and understanding in its continued inspections. By maintaining our housing stock we create the opportunity for new families to look at our neighborhoods and say "this is where we'll raise our children." I believe that we can find additional resources and forge cooperative relationships with other agencies to assist homeowners with their improvements. We just have to be willing to look outside the borders of the old school of thought. We also need to re-examine our permitting costs as a means to encourage redevelopment of properties.